Expected for release March 17th, Sage 300 ERP 2014 takes speed and simplicity to the next level with an improved desktop layout and easier-to-use data entry screens. Let’s take a closer look. A redesigned desktop in Sage 300 ERP 2014 is more simple and organized so that you can find the screens and functions you need more easily. The new Ribbon Style Menu at the top of the screen puts the tools and features you need most right at your fingertips. The new desktop also features Modernized Icons that not only look great, but are more meaningful and help improve screen and menu navigation. In addition, you’ll also notice that the left-side Navigation Tree is updated to reflect the standard Microsoft-style menu that most of us are familiar with. More than just a pretty face, the new desktop replaces complexity and little-used functions with a cleaner and simpler design that saves time - all without sacrificing the workflow that you’ve grown accustomed to. Blast from the Past! 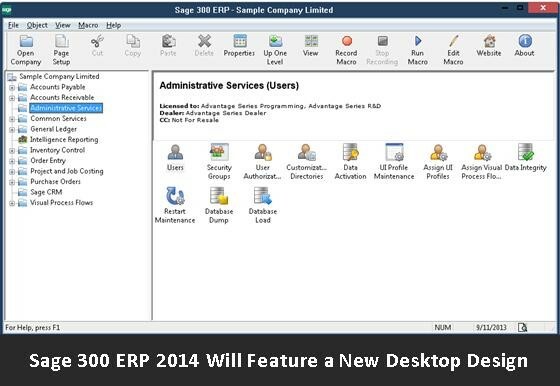 Check out Sage 300 ERP Desktops Through the Ages for a trip down memory lane. See how far the Sage 300 desktop has come over the years. Every new release of Sage 300 ERP introduces new functionality. But over the years, all those new fields, features, and buttons can clutter up your data entry screens. Since technology has changed quite a bit since the last major screen refresh back in version 5.0A, Sage 300 ERP 2014 embraces new technology with screens that are more clean, modern, and intuitive. With data entry screens that are 30% larger, you get Improved Column Alignment and more white space making your system easy on the eyes and less distracting. To ensure you can still find what you need, Sage hasn’t rearranged or moved fields around. Everything should be where you remember it, just laid out better using some extra space. In addition, any Required Fields in data entry are now visually indentified with an asterisk. This new feature helps you avoid annoying error messages and shorten the learning curve for new users. Stay tuned for the official Sage 300 ERP 2014 release announcement in March and be sure to contact us if you have questions or need assistance with an upgrade.